Perfect Turf is very excited to announce a ProGreen sponsored video from YouTube dog training sensation Zak George. This video was published on Saturday, August 4th and features our new K9 Champion turf. For those of you that are not familiar with Zak George, he is a celebrity dog trainer and YouTube star that has trained thousands of dogs throughout his dog training career. He is well known for his YouTube channel “Zak George’s Dog Training Revolution” that is free for anyone to subscribe to. It is the number one destination for people that are searching for dog training information throughout the world, and has more than ten million views annually. Zak’s first book “Zak George’s Dog Training Revolution” was published by Penguin Random House in 2016. Zak George’s goal is to raise the standards in the dog-training industry as he utilizes the latest in scientific understanding of dog behavior while integrating the latest twenty-first century ethics. 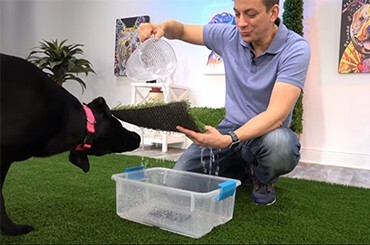 He is a strong proponent of positive reinforcement dog training for your dog, and he wants to spread the word that people shouldn’t treat their dogs like members of a pack. Even though dogs are descended from wolves, they are domesticated animals are a far cry from their ancestry. Also, he takes a positive approach that allows dog owners to tailor their training to their dog’s personality type and energy level, which helps to get quicker results and a much happier dog!